It is the former residence of Li Dejue and his brother, the owners of a well-known local trade company called Yongmaohe early last century. Li's family was among one of Tengchong's most prominent families with its long and successful practice in international business and trading. Li Kunba, 85, a fifth-generation descendant of Yongmaohe's founder, still lives alone here, taking care of the ancestral property. To better protect the house, Li decided to donate it to the government years ago. It has been turned into a museum demonstrating local architecture after being renovated by the government in 2000. The front courtyard is used to exhibit the family history of its owner, the middle one to show off local residential culture, and the backyard, attached to a hotel, quiet and elegant accommodation for tourists who wish to savor Heshun's culture and history. Li's daily routines include cleaning the house, taking care of the plants, and feeding her chicken. 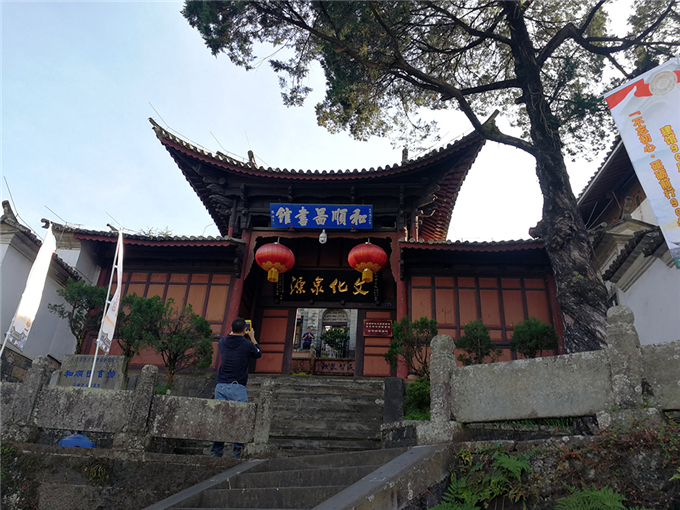 The house receives many visitors during the peak tourist season, such as the public holidays, Li greets them warmly, and often recounts family stories to those who have the time to listen. "I grew up here," she says. "I can live a very peaceful and quite life here in my old home. It's why I don't want to go to live with my children in the city." The former Southwest Silk Road ran through Heshun, which flourished as a result of the passing caravans, and resulted in a potpourri of cultures having an influence on the town. Since it is only 70 kilometers from the China-Myanmar border, it used to be very popular for local residents to travel to Myanmar to trade in jade or to make a living some other way based on that proximity. However, many of the same business people never returned, even if they still have strong ties to their hometown.